Changes at the Beacon Pub? 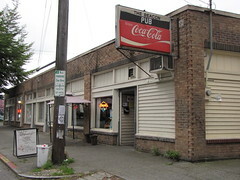 The Washington State Liquor Control Board announced this week that the owners of the Beacon Pub have applied to change the location of their liquor license from the current location at 3057 Beacon Avenue South to 5609 Rainier Avenue South. Is the Pub moving away from Beacon Hill? We stopped by to ask, but no one was in who could answer our questions. We are wondering if the Beacon Pub site might be the mystery location that is soon to be the Bar del Corso pizza restaurant. Nice investigative journalism! I wonder what’s up?!? We hope to find out soon! When I walked my dog by the Beacon Pub this morning (June 11), the sign board out front was advertising hot, fresh, hand tossed pizza, whole or by the slice. How unfortunate that to gain a much desired business, we might (sounds very likely) be losing another long standing, popular business. Why can we not have both of these businesses up here on the Hill? I appreciate and like the Pub for what it is, a pub. Sometimes that is all you want or need. If indeed we are to lose it, I will sadly mourn the loss and in that same bittersweet moment, look forward to the chance to walk with my family to the local pizza place. But does the Pub really have to go to Columbia/Hillman City? Ugh. Mixed emotions for sure. Lori and her mother always seemed to want to make something work with food. Years ago I remember her mentioning a plan (dream?) to lease the space next door, bust down the wall, and put in an all-ages pizza place; pretty much the same concept as Stellar in Georgetown. The best of both worlds, which is why we are there so often. I wonder if the new pizza place will just be within the existing Pub footprint. Why couldn’t the pizza place take the space next to the pub so we can have both? I just hope they are both successful. Now you can put a bar/alehouse near the top of my list of services needed on Beacon Hill. Sorry to lose the pub but not too sorry – we have a rental house on Orcas near the new location and I am gals to have them as a new addition to that little Hillman City bus. district. I LOVE the storefront they are going into, so I’m hoping they make the inside a little nicer than the current Beacon Pub in order to better compete with the CC Alehouse. As for having an alehouse up here, I am hoping someone has the vision to transform the warehouse next to ABC Market into a 2-story alehouse/music venue, a la Elliott Bay Brewing in West Seattle. Family friendly would be nice too. Maybe Elysian is ready for a 4th location . . . We all need to generate enough enthusiasm with businesses we know and like, or those who might be able to start a business we’d like to get them to think of Beacon Hill as a viable option. I am guessing that it will take some more housing up here at our town center (thinking El Centro’s project) to generate the bodies that will cry out for those eating and drinking venues. This is outstanding news, mostly because it shows there’s a landlord who’s (finally) ready to replace musty old tenants with newer tenants who better reflect the neighborhood’s changes. Hopefully the pizza place will go through and serve as inspiration for other property owners. I agree with Suzanne that the development of the neighborhood does need some vision and what a great idea for the warehouse. However, from what I hear the owners aren’t so much into what would serve the neighborhood well. I also agree that we need to be vocal and let businesses know that we are ready and willing to support those businesses. I do have to take issue with Jay’s comment though about musty old tenants being replaced with newer tenants reflecting the neighborhood’s changes. Why can’t we have both? I’ve enjoyed my time spent at the pub, always with fellow neighbors, and I think the pub is a good reflection of our neighborhood. It might not be pretty, but that’s part of it’s character, and the beer has always been good. If the Pub is leaving whatever business that takes its place does NOT have my support. Real neighborhood bars are becoming more and more rare and I don’t see why a pizza place needs to push out the only place on the hill where you can go and fraternize with your neighbors. Also, with the high overhead and low profit margins of a pizza place, the likelihood of nothing at all existing at 3057 Beacon Ave South a year from now is very real. When I read these comments I see supporting arguments for not delaying increased density. More retail spaces allow for more businesses, and increased supply puts downward pressure on rents, benefiting the business owners. Say it aint’s so. I’d hate to see the pub go. “Jay” is not the type of neighbor I want! @Pat – what makes you think the pizza place is forcing out the Pub? The Pub has quite a nicenew location in an up and coming neighborhood. More power to them. As for “the pizza place” I think you’ll find it will be more than that. Jerry Corso is not only a 1st class chef but he lives on Beacon Hill. What’s wrong with his wanting to open a place where people can EAT and drink and have a conversation? Well, the good thing about more bussineses around Beacon hill is that creates more jobs for our local people just like my brother Oscar and i have been doing for the past 15 years at javalove/bajabistro and now at The Station coffee shop, so I hope they also hire people from beacon hill thats the only way they’ll get me to want to go there. I third Susan! What does “Jay” mean “better reflect the neighborhood changes” ? Are we all pizza-fed Italians now? Once again — we don’t have any confirmation yet that the pizza place is moving there. Also — we don’t have any reason, currently, to think that the pizza place “forced out” the pub. The pub might have just decided to move when their lease was up, anyway, for any number of reasons. And then the site would be available for a new business to rent. Hey everybody, thanks for your thoughtful responses to my comments. I probably didn’t word things very well, what I meant to say was that there are a lot of people now living on the hill that would patronize a higher-scale restaurant and bar — people that you simply don’t see in the Pub for whatever reason. I wasn’t trying to sound exclusive; the Hill’s diversity is why I moved here and decided to raise my children here, and it wouldn’t be the same without the fish shop etc. That said, I also have to say that one of my favorite parts of this list are the people who constantly invoke Ballard as the nightmare scenario for Beacon Hill. Seriously?! Imagine a movie theater, a dozen restaurants, multiple bars catering to all sorts of different clients, live music venues, all within walking distance…plus an influx of new jobs. We could all get rid of our cars. Our houses would be worth more. The city would finally start taking care of our streets. Our schools might even improve. I can barely stand the horror! Let change happen. Stop holding Beacon Hill in the 1970’s. I bought my home on N. Beacon Hill 11 years ago after renting on Capitol Hill and West Seattle. I have to drive to other neighborhoods for choices in food, shopping and anything else. It’s like I live in an isolated suburb. I think it would be great to have more development and more choices. I don’t hang out at pubs, taverns, watering holes or whatever you want to call them, so maybe I’m biased. Existing business’s move locations for many reasons. I’m really happy that are keeping there doors open and not going under like so many others in this economy. I have made many good memories at the Beacon Pub and am glad they will still be keeping their doors open, even if at another location that I can’t walk to anymore. The move was the business of the landlord & pub and I don’t think you can put blame on whatever business is moving in next. Maybe this will create an opportunity for another bar owner to open up shop on Beacon Hill? I’m so glad we’ll be getting more food (AND drink) options on the hill, whether it’s in the pub location or elsewhere. Please don’t make assumptions about the new Bar del Corso being a “yuppie pizza place with $20 pies.” It’s not even open yet! I’m just so happy we have another Beacon Hill resident who is willing to put themselves out there, at risk, to open a business up here. They will certainly have our patronage where ever they open.